Hello everyone! I haven’t posted in a few weeks, still getting used to some new medications but feeling a lot less tired now. 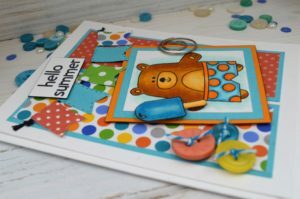 I am absolutely thrilled to tell you that Kim Hughes from Paper Smooches invited me to be the guest designer for August. I didn’t want to say anything until the first card was posted. 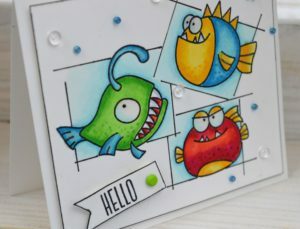 Paper Smooches is one of my favorite stamp companies. Kim’s style is clean and whimsical. The August release includes all sorts of writing implements and things like a typewriter, a darling desk light, an inkwell, and a feather pen, to name a few. It’s a great set for back to school and for welcoming or saying goodbye to team members at work. 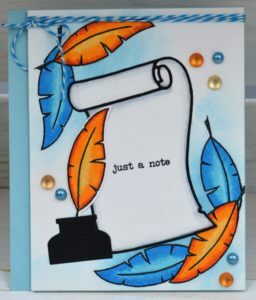 This card uses the feather, inkwell and Just a Note stamps combined with the die-cut rolled piece of paper. I love the way Kim’s die cuts often cut a border for the die cut. I cut it twice, once from black card stock and once from white, and combined the black border with the white inner pieces. I stamped and masked the feathers in the corner. This was colored with Copic Markers and sponged with Tumbled Glass Distress ink. To visit the Paper Smooches blog go here. About a week ago I was on PTO, enjoying a staycation. I was thrilled to be able to go to breakfast with a friend I hadn’t seen at least 20 years and catch up with her. It made my day. Afterward my hubby and I did a bit of grocery shopping, and after lunch I decided to take a nap. I woke up feeling like I had been drinking coffee non-stop and shortly after that realized my heart rate was pretty high. It was about 174. I tried some tricks I’ve been taught to bring it down, and nothing worked. After that, off to the ER and then a week in the hospital. I’ve lived my entire life with a congenital heart defect. I’m blessed in ways I can’t even count, and one thing I’m very aware of is that I have had 55 years of life that no one expected me to have. I had the most amazing nurses at the hospital – you know who you are – you beautiful ladies! They made my stay there bearable and let me tell them lots of dumb jokes. Things seem to be under control now, and I’m back! I was pretty tired the first few days and didn’t even really feel like making any cards. This one I actually started before my interruption, and finally finished. 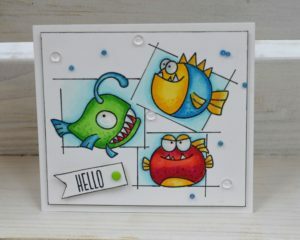 I wanted it to be very simple and easy, and I’m having a little love affair with round cards, as you may have noticed. This was so easy to make. I just used a cloud stencil (I’ve actually had it for over 20 years – does anyone remember Inkmarks Inc.?). It’s called Shirley’s Shapes Magic Clouds. 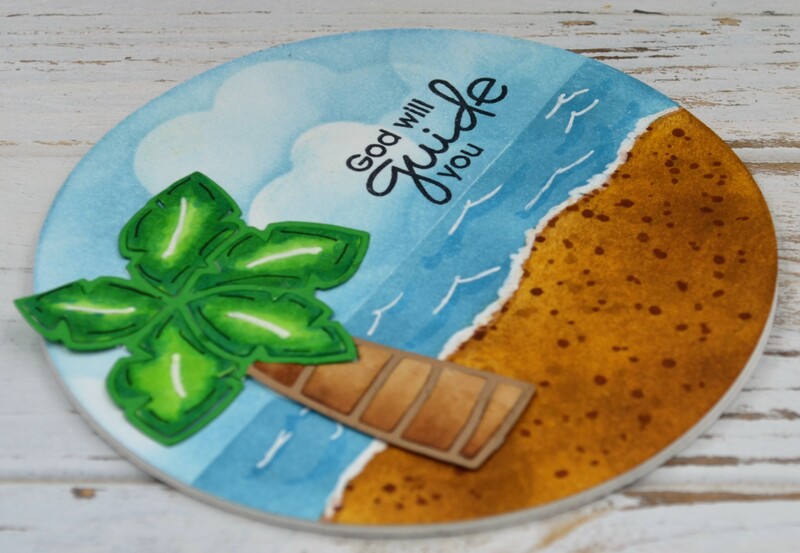 The die cut is a new one from Paper Smooches, and the sentiment is from Paper Smooches. I used Post-It Note tape and cut it to make the sand hills. I used different colors of blue and brown Distress inks. I stamped the sentiment in Memento Black. I cut the die cut from white, green and kraft card stock. I colored all the white inside pieces with Copic Markers and placed them back inside the brown and green outlines. I used a white gel pen to add wave accents to the water and the foam to the edge of the sand, as well as highlights on the palm fronds. I had fun making and felt like the sentiment was perfect to express how I’m feeling right now! To me Christmas is magic – for God so loved the world. What a truly amazing gift! And now it seems even more important to practice God’s love and mercy, with all the awful things happening in our world. I had such fun making it – in spite of the fact that I smudged it horribly in two places and had to cover my mistakes with the sentiment! To make this card I folded some Neenah 110 Solar White Cover stock in half and cut the largest circle die I had out of the folded piece. 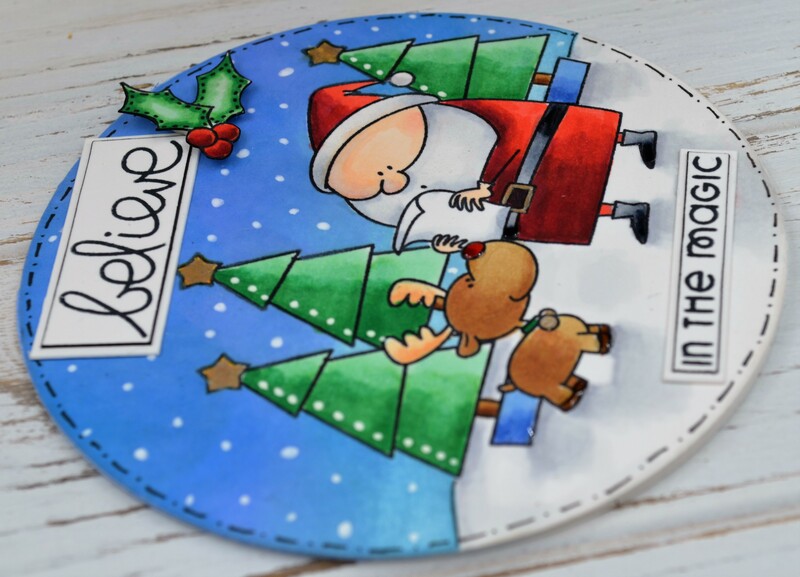 The trick is to put one part of the circle slightly beyond the fold so that you cut out a folded circle card. 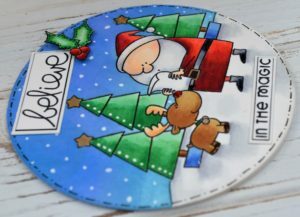 It will have a flat top, but to remedy that, simply cut a single circle from the same die and glue it to the front of the card. I stamped all the pieces except the words and the holly and berries on the masking paper (I used Simon Says Stamps brand which is my favorite). I cut the mask for the snow hills on the bottom out of wide Post-It Note tape. 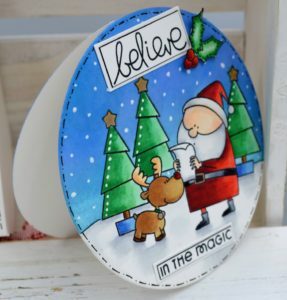 Stamped in this order: reindeer, Santa, left-hand tree, middle tree, and the right hand tree. All of these images are from Jingle All the Way by My Favorite Things. I left the masks in place and sponged with Distress inks in various purples and blues. The holly and berries is from the You Keep Me in Stitches Memory Box set. 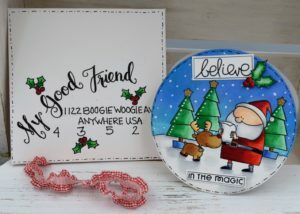 The sentiment is from the Paper Smooches Joyful Greetings set. I colored everything with Copic Markers. For the sky I dotted various sized dots of white gel pen to make it snowy. I also added some white dots to the trees. For the stitching around the edge I used a Copic fine line marker. 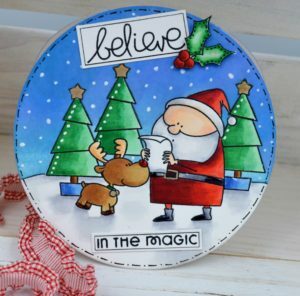 I used gold gel pen on the reindeer bells, the belt buckle, and the stars on the trees. I added some Glossy Accents to the tree holders, the belt, the shoes, the hooves and the reindeer’s nose. I added some Wink of Stella here and there to give it some sparkle. Just for fun I made an envelope using the WeR Memory Keepers envelope maker – I’ve been practicing faux calligraphy. There’s a photo below. Summer – long days, sunshine, lovely flowers and the warmth! The only reason I can survive winter is because it makes summer even better.. When I was a kid my mom used to make homemade popsicles out of Jello and Kool-Aid. They were so good! I had to look up the recipe to share – and I found it! Dissolve the Jello and sugar in the boiling water. Dissolve the Kool-Aid in the cold water. Mix the Jello/sugar mixture with the Kool-Aid. Pour into paper cups or popsicle molds. Freeze until the partially frozen and then put in the popsicle sticks. Freeze until solid and then enjoy. Yummy! This little bear from Simon says Stamps is eating a raspberry popsicle. 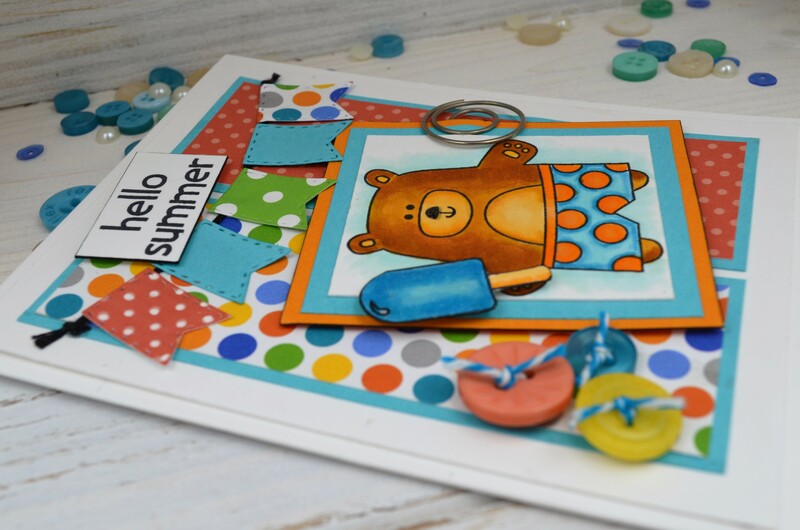 I had such fun making him and seeing how much stuff I could jam onto one small card (halfway kidding – but I did add a lot of extras!). I love his little polka dot shorts. I colored him with Copic markers and I added a little smile to his sweet face because obviously a raspberry popsicle would make him smile. 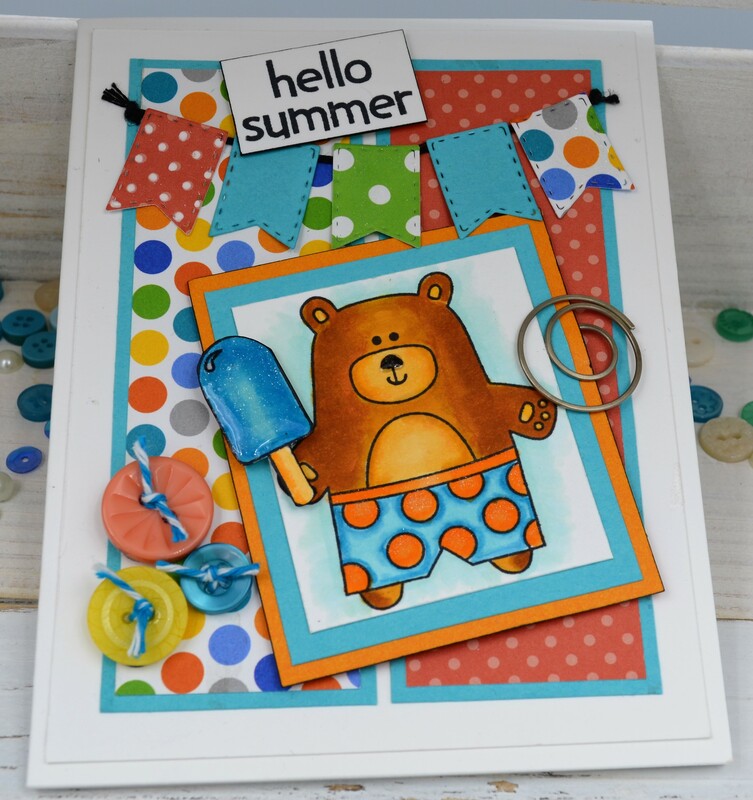 The popsicle and the sentiment are part of the stamp set. I used Wink of Stella and glossy accents to enhance various parts – the polka dots on the shorts, some of the paper flags, the popsicle, and the bear’s nose. The flags were die cut from a Clearly Besotted die cut set. 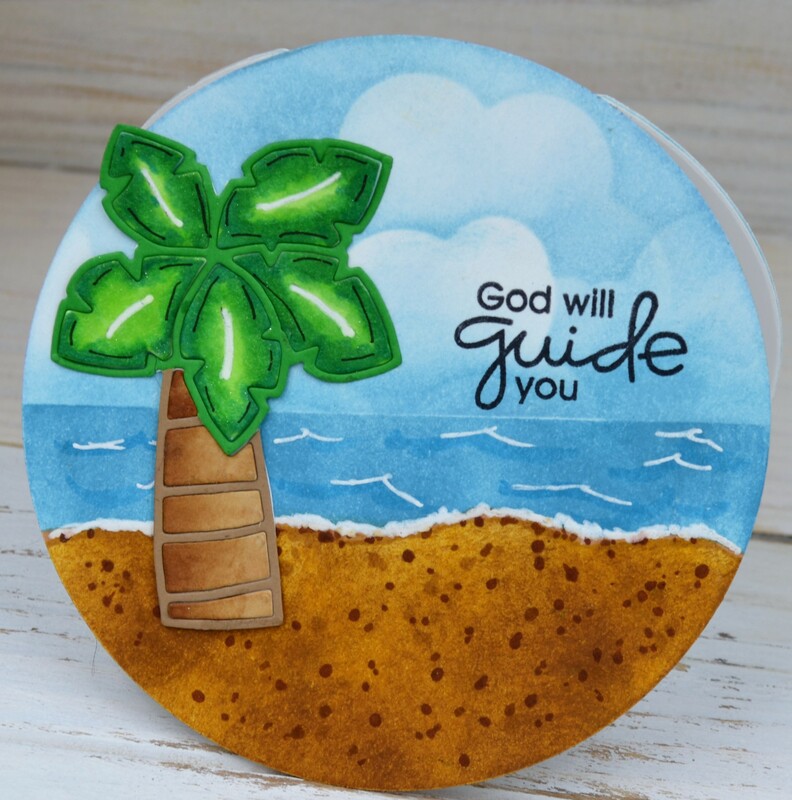 I did some layering of papers and attached both the flags and the buttons with Glossy Accents, I added a little circle paper clip just to add some interest and glued the finished product to an A2 card. It’s hard to see the Glossy Accents and Wink of Stella – hopefully the pictures below will help. These little fish also come with the saying, “That Bites”. Couldn’t think of anything I need it for right now but I WILL find something. This set is from Avery Elle – aren’t they fun? Love the big teeth, too. I stamped them in Memento ink on 110 Neenah cover stock. I get it in packages of 250 at a time and can barely lift it – but it’s the best price around. I get it a local paper store that caters to printers. About 20 years ago now, I started a sales rep firm and sold rubber stamps and scrapbooking supplies to wholesale accounts. The paper store is where I met my future business partner. 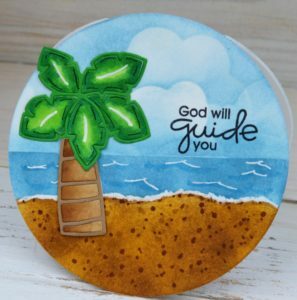 She convinced them to put in stamps and scrapbook supplies – because so many ladies who were stamping and scrapbooking kept coming in for paper. That was the very first consulting job I ever did. The manager at the time told us to just put in whatever we needed to in order to make the grand opening a good one. He didn’t give us a budget, and we ordered over $20,000 worth of supplies (sounds like a lot, I know, but it was really very conservative). We were given a space in the store and covered the windows with paper so no one could see inside. About a week before the grand opening the manager asked me how much I had spent. When I told him, he put his hand on his heart and said, “I’m going to get fired!”. Boy did that scare me! But I was pretty sure things would go well. Grand opening day there was an enormous line outside the store. We sold out of almost 1/2 the inventory that day. It was entirely awesome . The best part was, no one got fired, and ‘they were a great customer for as long as we were in business. At that time, too, there were these awesome markers called Studio II markers. They were alcohol-based, and like Copics were designed for graphic artists. Unfortunately there was an issue with the caps – they were skinny pens and so the caps were small – small caps have to have a hole in them in case someone swallows it and it gets stuck in the windpipe – air can still get in and out. So they would dry out very quickly, and they were expensive! Also I don’t remember them being refillable. That’s when I first started using Copic Markers. 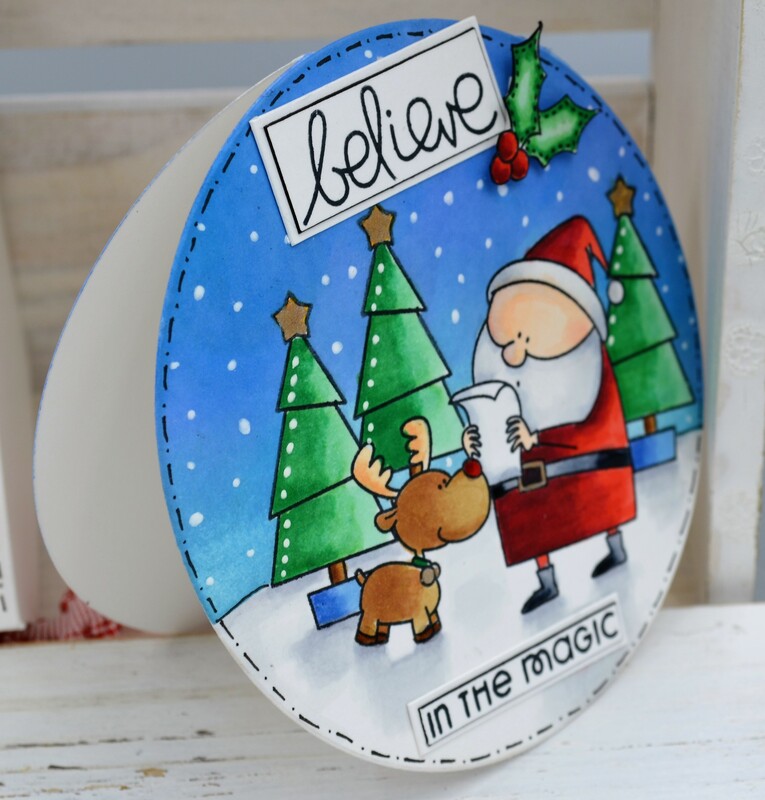 A bit over 10 years ago I gave up stamping – I had gotten tired of it for a variety of reasons – but I kept my very large collection of Copic Markers. Most of them still worked! A few were dried out but that was easily remedied. I’m so very glad I kept them, as I’ve re-discovered my love of coloring. I love colored pencils, both with and without gamsol, but Copics I think may always be my favorite coloring method. At one point one of my vendors invited me to write a “how to” book – that one I did all in colored pencil. A few years later I designed and illustrated all the samples for their yearly catalog, and by that time I was using alcohol-based markers. So for this attempt at what’s now called Clean and Simple (lots of new terms I’m learning!) – which by the way I love but am not good at – I stamped them and then used a Copic fine line marker to draw little boxes around them. Colored everything with Copics, then added some seed beads and clear pearls because I could’t help myself. I almost wish I hadn’t because I think it would have looked better, but as they say, que sera sera. I used some Glossy Accents to make the eyes look 3-D, and added Wink of Stella to the fins.The sentiment is from this set and I just use a green brad for an accent. I did fix the yellow that ran outside of the fish on the top right hand side after I took the picture, but was too lazy to take another. Thanks for stopping by and “listening” to my ramblings. Let me know if you’d like it if I also included the Copic Marker colors I used – not sure if anyone wants that level of detail or not.